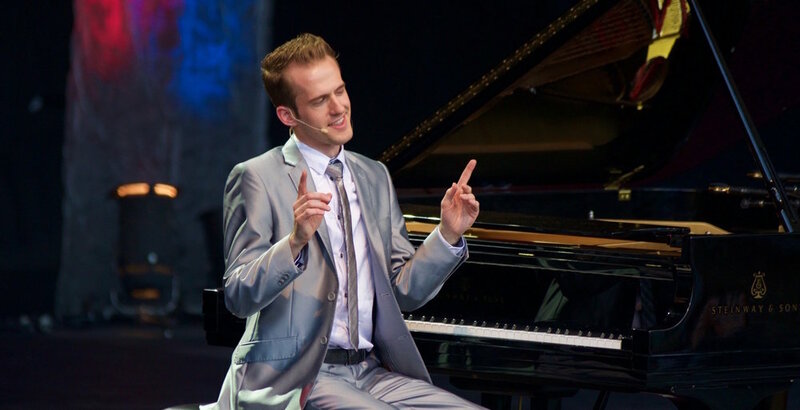 Jason Lyle Black is a nationally-acclaimed pianist, composer, and entertainer known for his unique blend of music and comedy. Watch the video at left to see why Ellen Degeneres calls Jason Lyle Black "Unbelievable!" Black reached #1 and #2 on the iTunes and Billboard charts for his album, Piano Preludes, as well as over 30 million people worldwide with his music videos. Huffington Post calls him "Spot-on"; TIME.com "Incredible;" and Ellen Degeneres, "Unbelievable!" Flight of the Bumblebee — Amazing and familiar instrumental solo that leaves audiences blown away. "The Wedding Pianist" — Stand-up comedy routine where the music itself is the punchline. See video below. "Songs Not to Play at Funerals" — This hysterical real-life story leaves audiences laughing at what concert pianists do when you aren't paying close attention. Rhapsody in Blue — One of the most popular classical pieces ever written, this showcases Black's remarkable talent. Live requests — In this hugely popular segment, audience members text in songs they want to hear, from Beatles to Disney to AC/DC, which Black plays seamlessly, on the spot. What if we don't have a piano? We know piano dealers throughout the country and have even gotten pianos to remote areas — wherever your event is, we'll help make it happen! How long is the show? Black's full show is 90 minutes. Some corporate clients request a 20-45 minute show for their event. We are happy to tailor the show as needed. Please use the form at right to find out Mr. Black's availability, or reach out directly to the appropriate individual below. You will receive a response within 24 hours.